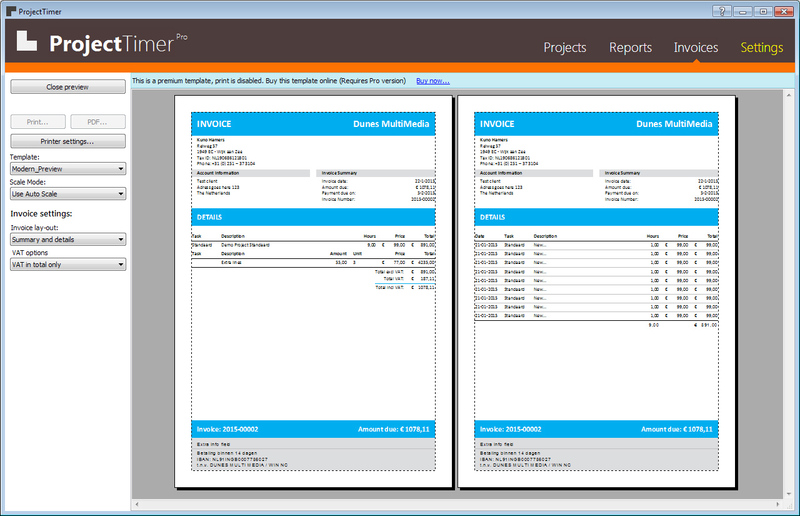 How can I create invoices in Windows? 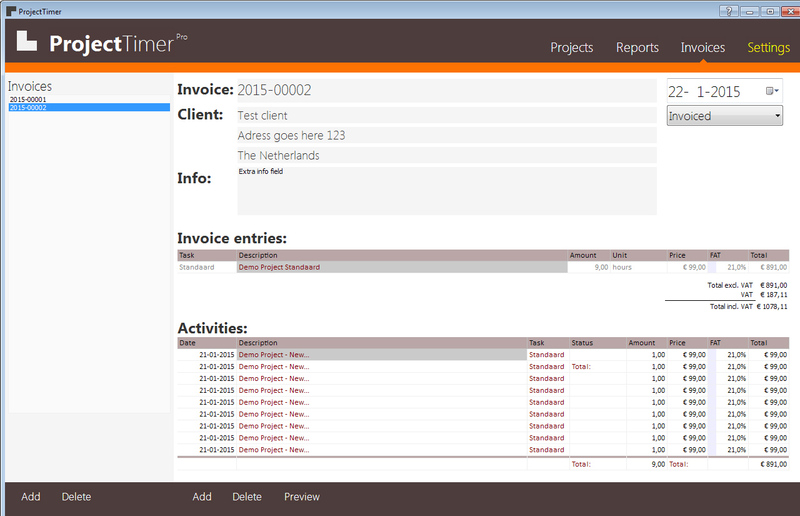 New in v1.1.2.0 is the ability to create and manage invoices based on your time-tracking activities. Can I connect Project Timer to my existing time tracking system? 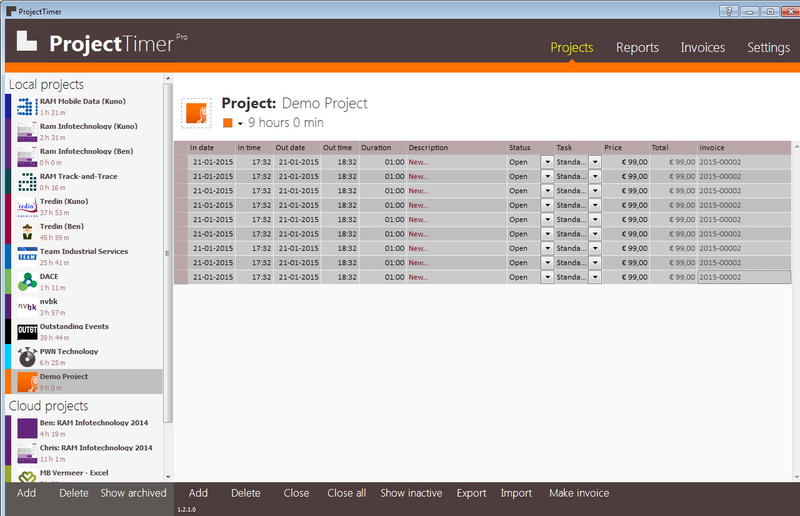 The full version of Project Timer (Project Timer Pro and Cloud) will include the ability to install connector plugins for various popular time tracking systems in the near future and is still under development. Where can I download Project Timer? You can install the latest Project Timer by clicking the “Download free version” button on the right of the main Project Timer page. In order to use the advanced features of Project Timer you must enter your license key (which will be emailed to you when you confirm your purchase) in the startup splash screen of the Project Timer application. 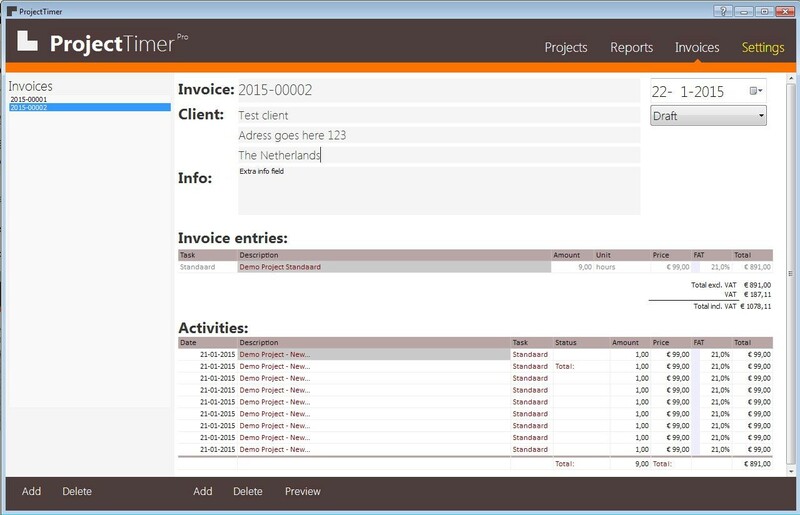 How do I buy a Project Timer Pro license? You can purchase a license from our online store. Secure payment processing is handled via Share-it / Ecommerce and accepts all major credit cards, paypal and many local payment options. What types can I export the timer data? Can I import old information into ProjectTimer? How can I export multiple projects? 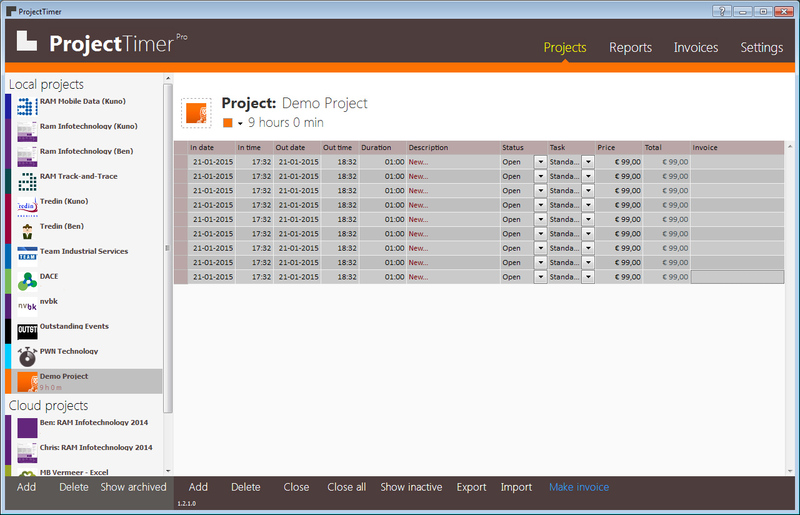 In the Pro version you can select multiple projects using a filter and export the timer data. Where can I find Project Timer on the web also? Does Project Timer communicate back to the internet? If so why? Occasionally, antivirus software may prevent applications from making cloud calls without permission. Check the documentation with your security software for specific instructions for your system. Where is my data stored? How can I back it up? 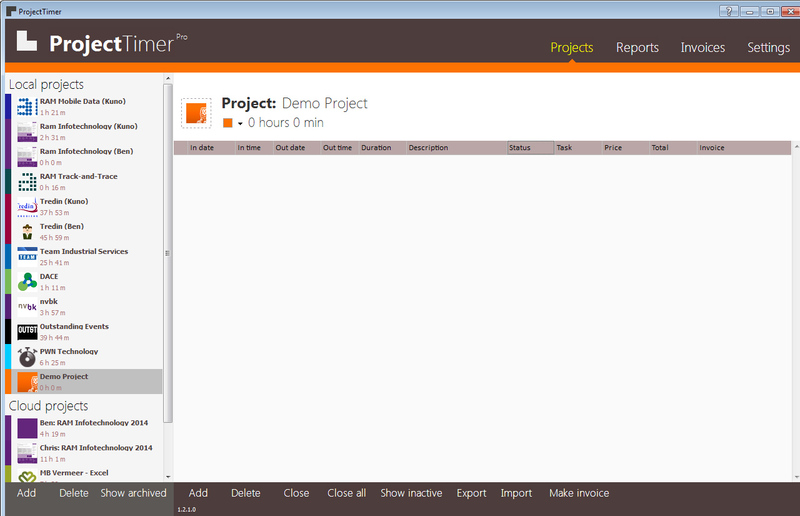 The data for Project Timer is stored in a file called ProjectTimer.xml. The default location of this file is in the My Documents folder but you can change that on Settings > General > Data file. Click on “Administer” to open the main screen. Close project timer completely (Right click on project-timer icon in the tray-bar and select “Close ProjectTimer”. Will you be developing a iphone, ipad, android and web version? Our goal is to create an cloud app that allow your Windows timers to be triggered from these platforms. The admin side will be on your pc. In the ProjectTimer popup screen click on the ‘hamburgermenu’ ( ≡ )of the project of interest. Now you can select on which time you would have started or stopped the timer. Find the option ‘Popup tracking period’ in the settings screen. By selecting the option, only the timer totals (per project and overall) are summarized over the given period, but the older timer information is still stored and available for reporting, invoicing and so on. Only the ‘actual’ period is taken into account in the summary, so if the tracking period is ‘per day’ then only the timers of this day are shown, and if the tracking period is ‘per week’ only the timers of this week are shown. How do I set the default currency and price? The currency is in the General section and to alter tasks and their pricing you need to go to Task section. Drag the Project Timer icon to the visible part of the tray area.